Happy 4th of July everyone! I thought that it would be interesting today to remind everyone how to properly display the US flag. I constantly see people showing it wrong. Here are some tips to so you will know the rules and regulations for displaying the flag. On A Wall. 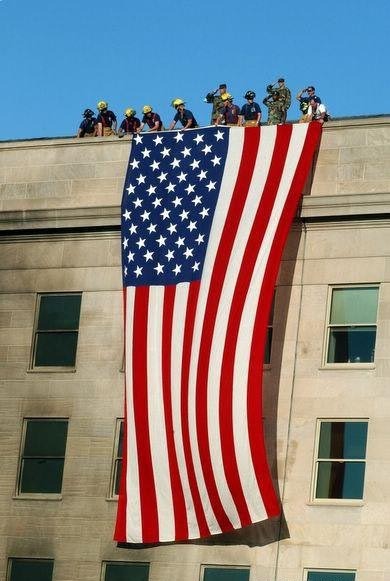 When the flag is displayed either horizontally or vertically against a wall, the union (the part with the stars) should be in the top position and to the flag’s own right. So, when a person looks at the flag, it should always be on the observer’s left. When displayed in a window it should be displayed in the same manner with the union to the left of an observer on the street. With Other Countries. When flags of two or more nations are displayed, they are to be flown from separate staffs or flag poles of the same height. The flags should also be approximately the same size. The flag of one nation should never be above the flag of another nation (except for very special circumstances like the Olympics medal ceremony, etc.). With State Flags. The flag of the United States should be in the center and at the highest point of a group of flags or when displayed with state flags. When the US flag is in a group of flags with flags from the states, local flags, or group flags, the American flag is always displayed in the middle position. On Parade or Display. When the flag is carried in a procession with another flags, the American flag should be either on the marcher’s right if there are only two flags. Or, the American flag should be in the center if there is a line of flags. The flag of the United States of America should hold the position of superior prominence in front of an audience. The flag should be in the position of honor at the speaker’s right as he faces the audience. Any other flag so displayed should be placed on the left of the speaker which would be to the right of the audience as they are looking at the speaker. For other great flag tips and flag protocols on caskets, cars, folding, etc., check out these great sites…. Previous post: Finding Your Asset Allocation And The Perfect Balance Between Stocks And Bonds?